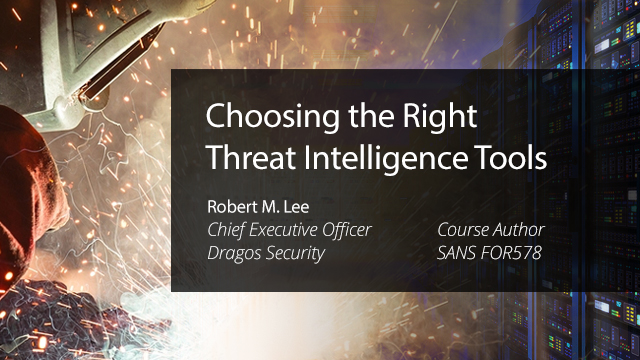 In this webinar Robert M. Lee, Chief Executive Officer of Dragos Security and course author for SANS FOR578, a well-known threat intelligence class, will share a sample threat intelligence process that analysts can use — and show how this method can help inform purchase decisions. Are you interested in understanding how to move beyond threat feeds and how to appropriately incorporate professional tools into your workflow? If so, join this webinar and hear from one of the industry's leading experts. Robert M. Lee is the Chief Executive Officer and Founder of Dragos Security, a critical infrastructure cybersecurity company, and course author for SANS FOR578 “Cyber Threat Intelligence." He's also a non-resident National Cyber Security Fellow at New America and a PhD candidate at Kings College London, focusing on cyber security policies for critical infrastructure. Robert was named to the 2016 class of Forbes "30 Under 30" for Enterprise Technology. While serving as a Cyber Warfare Operations Officer in the U.S. Air Force, Robert obtained his start in cybersecurity.